The new year is the perfect time to set goals, start a new habit, reflect on what you've learned from the past year, and let go of what holds you back. It's also a time to reflect on your choices and move forward. Eleanor Roosevelt said, "The future belongs to those who believe in the beauty of their dreams." If you are feeling the burnout from 2018 and want to recharge for the new year, I have 5 suggestions for avoiding burnout in the workplace. 1. Know Your Purpose. In order to be fulfilled in your job, you need to know why you do what you do. Think back to why you became an SLP. 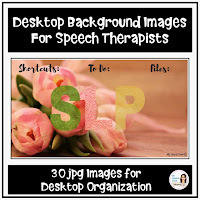 Every speech-language pathologist and educator has their own unique life experiences, and no two stories are the same. Ask yourself, what do I need from my job? What part of my job is most rewarding? What successes have I seen in my job? It is easy to get caught up in the "to-do lists" and forget our purpose. 2. Surround Yourself with Like-Minded People. Friendships are built on common interests and values. When you surround yourself in the workplace with individuals who share the same interests and values, you are motivated to become more diligent and productive. You will pick up on their positive habits, and be willing to take constructive criticism when needed. 3. Balance Your Work and Family Lives. Be sure to take time for yourself. As a public school SLP and small business owner, I am always looking for ways to be a "better SLP." But I also have to remind myself that I am more than just an SLP. I am a wife, mother, daughter, sister, and friend. Enjoy those special people in your life and cherish each hour you have with them. 5. Decrease Clutter. Clutter is having things lying around in an untidy space. It can also mean not being able to let go of things, and struggling to make decisions. I recently de-cluttered three cabinets in my office by scanning old therapy materials and uploading them into my Google Drive. Decreasing clutter may mean cleaning out your email, limiting screen time, tidying up your work space, or digitizing receipts and papers. What can you de-clutter from your work space? I hope you will be able to implement at least one of these suggestions in the workplace. 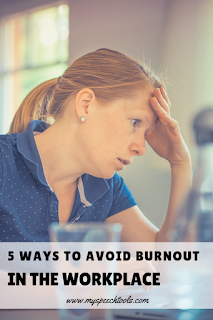 Comment below with how you avoid burnout. I'd love to hear from you. Don't forget to sign up for my newsletter and follow me on Instagram, Facebook, and Twitter. 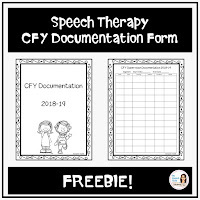 Link below to download my FREE CFY Documentation Forms and Desktop Background Images for SLPs.